You'll be £4.99 closer to your next £10.00 credit when you purchase Killing the Bismarck. What's this? He describes the tense atmosphere as cruisers play a lethal cat and mouse game as they shadow Bismarck in the icy Denmark Strait. We witness the shocking destruction of the British battlecruiser Hood, in which all but three of her ship's complement were killed; an event that filled pursuing Royal Navy warships, including the battered battleship Prince of Wales, with a thirst for revenge. While Swordfish torpedo-bombers try desperately to cripple the Bismarck, we sail in destroyers on their own daring torpedo attacks, battling mountainous seas. Finally, the author takes us into the final showdown, as battleships Rodney and King George V, supported by cruisers Norfolk and Dorsetshire, destroy the pride of Hitler's fleet. This vivid, superbly researched account portrays this epic saga through the eyes of so-called 'ordinary sailors' caught up in extraordinary events. Killing the Bismarck is an outstanding read, conveying the horror and majesty of war at sea in all its cold brutality and awesome power. A timely look at the destruction of the Bismarck as the first part of a meter-annd-a-half long partwork model is on sale in the newsagents. This is Boys’ Own Story stuff! I remember reading a book called Sink The Bismarck in my early teens – I would have loved to read this back then, and still enjoy such wartime accounts now. well-documented nature of Bismarck's sole operation and her actions, pursuit and sinking, it may well be wondered whether there was anything genuinely new left to say on the matter. However, Ballantyne has succeeded in obtaining new first-hand acconuts which have been added to the narrative. . . 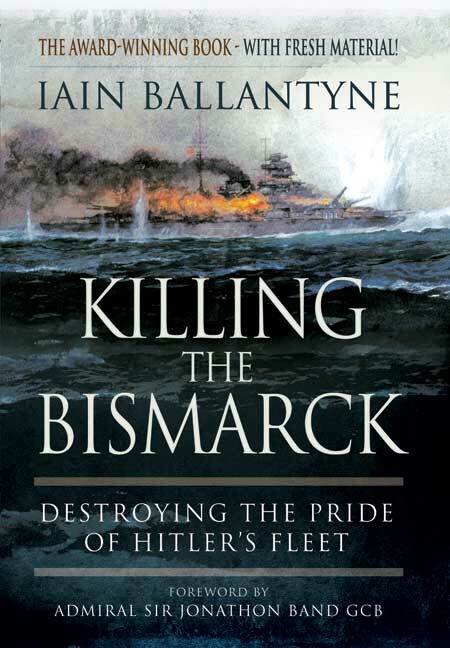 Overall, Killing the Bismarck is an excellent one-volume overview of the Bismarck affair, with a particular emphasis on the Royal Navy's part. Killing the Bismarck is delivered with the verve of a novel, taking the reader on a roller-coaster ride across stormy seas. This book provides a harrowing insight into the unremitting cruelty of war at sea and takes the reader on a roller-coaster ride in which each twist and turn yields new shocks. [It is] more than just another book about the hunt for, and subsequent destruction of the BISMARCK, its major point of difference being the author's extensive use of first-hand accounts which give the work human interest as well as historical accuracy. Not content with just publishing the original account in a new format, Ballantyne has added 18 pages of new material to the paperback. The telling of the final battle in which Bismarck is despatched is a lesson in the sheer cold murder of close up combat between capital ships. Remains the definitive account of the British part in the battle. A suspenseful narrative that will keep readers on the edge of their seats. The author gives us a real sense of the remorselessness of the sea on the body and mind; the horrific effects of explosives on a ship and on the flesh of its sailors. He conveys the meaning of the totality of warfare upon the great waters. Rob White, award-winning documentary filmmaker, whose notable productions include The Battle of Hood and Bismarck. In a twenty-six year career as a journalist, Iain Ballantyne has written on naval and military matters for publications as varied as The Naval Architect, Evening Herald (Plymouth) and FOCUS (now BBC FOCUS). However, it was for his work over the past decade, as Editor of the global naval news magazine WARSHIPS International Fleet Review, that Iain received a Special Recognition Award from the British Maritime Charitable Foundation in late 2007. An established author of naval history books, Iain has written various titles published by Pen & Sword, including HMS Rodney, HMS London, Strike from the Sea, HMS Victory and Killing the Bismarck. Iain is married with two young sons and lives in Plymouth.